So, Sexism Ed has been out for 28 days. (Who’s counting? I am clearly.) And there are few things that I want to direct your attention to. A man, who claims to be an ally and/or a feminist, has become a red flag for me. Especially if he loudly proclaims to be an ally. Especially if he looks around to see if everyone is paying attention to him. Especially if he insists on telling me about his feminism in detail while ignoring my arched eyebrow. I received emails, comments, tweets, and messages from academic men, who wanted me to know that sexism wasn’t a problem in academia. They told me about how their universities (or colleges) had women presidents. Or how their departments had a lot of women. Or how there were women in their grad programs. Or how they knew a women academic once. They sent me anecdote after anecdote about how women were doing fine in the academy to tell me that I was wrong. It was bewildering to see so many men try to shout me down for mere mention of a gender problem, which really just seemed to prove my point. 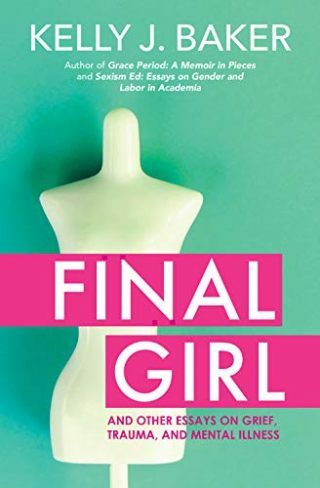 What I found instead was that I would write about sexism, and later contingent labor, in the academy for the rest of my life. The limits that I thought I would encounter were not there. The academy has a gender problem. And it’s not new. This shouldn’t have surprised me. We live in a patriarchy, but I had hoped that academia was somehow better than the culture surrounding it. You’ve written books on very different subjects. How did that happen? Oh, boy, I do *write* on very different topics from white supremacists to zombies to sexism, which tends to surprise people, who, I guess, think writers stick to one topic or two. I write about what interests and fascinates me but also I write about topics that make me nervous and uncomfortable. It’s kind of like, “What’s keeping me from sleeping at night? Yes, I’ll write about that.” But, I also like to write about topics, in which we already assume we know the shape (narrative) of the story, so that I can show how the topic is always more complicated than the popular assumptions about it. An author is supposed to be elated when her book is published. She’s supposed to shout from the rooftops (or tweet or email or message) about her accomplishment. She’s supposed to be beaming with pride. She’s not supposed to look weary when you congratulate her about her new book. She’s not supposed to seem bummed. Lovely readers, I have a small request for you. 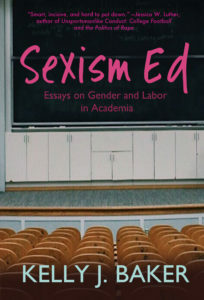 If you pick up Sexism Ed (or any of my books), please let me know. It is the best feeling in the world to know that someone is reading my book or books. Before I read Katie McLaughlin’s essay, “The Invisible Burden That Leaves Moms Drained,” I hadn’t given much thought to kin keeping. To be honest, I wasn’t even sure what kin keeping was. Her essay appeared on my Facebook feed on a day, in which I was sick and sequestered to bed with nothing more to do than read Rainbow Rowell’s Carry On, tweet, and scour Facebook for entertainment. As I read McLaughlin’s essay, I had an epiphany: I’m the kin keeper in our family, and this invisible labor leaves me emotionally spent and, frankly, exhausted. Kin keeping requires tasks that build and foster relationships as well as encourage solidarity not only in your immediate family, but also in your extended family. McLaughlin notes that kin keeping includes what seems to be small or even trivial tasks: remembering birthdays and sending cards or presents; planning and organizing family events, vacations, and parties; picking out and wrapping holiday presents; sending thank you cards; keeping in touch with relatives who live out of town by phone, email, or video-conferencing; organizing the family’s schedule and planning vacations; and remembering who gave your child/children or partner which gift. What might seem like small task on its own becomes more of a burden as the tasks pile up day in and out. I know it’s June. (Related, how is it already June?) Six months into the year seems an unlikely time for New Year’s resolutions. (You make resolutions in January, not June, Kelly!) But maybe now is the time to re-up those resolutions about making yourself a kinder human being and to forget any resolution that only makes you hate yourself. Here are my suggestions of a few quality feminist resolutions. This essay first appeared in Women in Higher Education’s February 2016 issue. I’m returning to these five goals now to remind myself to be a better person than I often am. I hope you enjoy. Also, never forget to act like mediocre white men when you need that extra shot of confidence. It’s February, but I’m thinking about New Year’s resolutions. The start of the new year is a moment to review the year before, decide what you want to accomplish for the next year, and figure out what bad habits to drop. It is time for fresh starts and new beginnings. Anything seems possible at the beginning of the year. Every year passed without a new me, who equated happiness and success with my weight and how much academic work I completed. At the start of 2016, I decided I’m over that noise. For years, my own resolutions revolved around weight, goals, feelings, and career. On January 1st, I would resolve to lose 10 or 20 lbs, find a tenure-track job, or finally be happy.